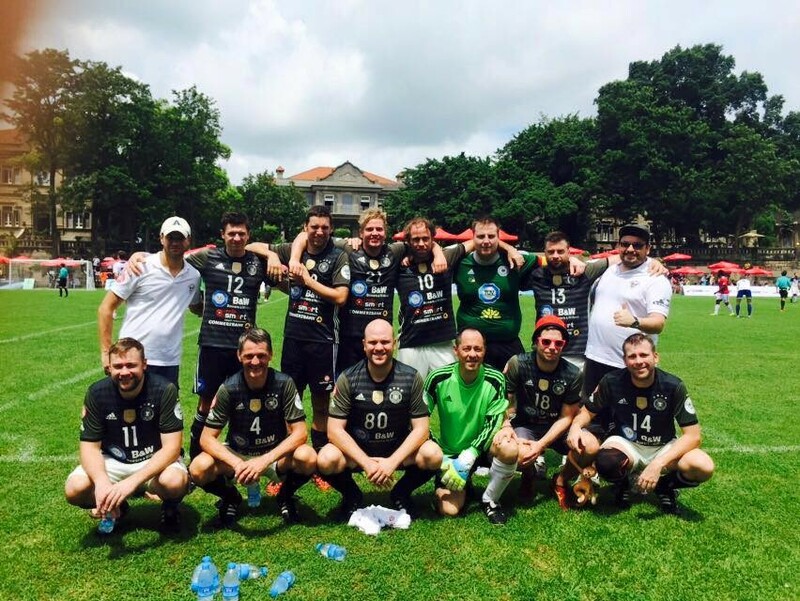 Club Tropicana came from behind to beat HK Krauts 2-1 in a show down at Happy Valley. Krauts started the game strongly moving the ball around well, playing at a high tempo and winning individual battles. They took the lead when Tropics failed to clear a ball out wide and a pinpoint cross onto Krauts prolific striker Bastian Braun head saw them lead 1-0. The goal woke Tropics up and they began to win possession further up the pitch and had the ball in the net just before half time but it was chalked off for offside. The second half saw Tropics make some changes in personnel which resulted in more energy and greater control in midfield. They levelled 20 minutes into the 2nd half when Frazer Adams turned in a shot after the Krauts keeper could only parry it into his path. It was 2-1 soon after when Kyle Wagner was left unmarked from a long free kick and flicked his header into the goal over the stranded keeper. Krauts never recovered and only had one long range shot which was turned over by Tropics gaffer Kevin Reid who deputized in goal for the day. With that win, Tropics leapfrogged Goodfellas into sixth place as the Fellas could only draw with J-Leaguers 1-1. A close game throughout, Rob Davis nodded Fellas ahead before Tomoo Takahashi levelled for the Japanese. This result leaves J-Leaguers in fifth place, one point ahead of Tropics who in turn are one point ahead of Goodfellas so the battle to finish in the top half of the season will go down the wire. The two teams sitting directly above J-Leaguers met in an entertaining and closely fought game with HK Scottish gaining revenge against DB for their 5-0 drubbing February. The Stags went 2-0 up and were mainly in control of the game via Aaron Tennant and Adam Pursani but DBFC managed to pull one back and pushed on to pressure the Scottish defense but they held out for a crucial 3 points. They now sit locked on 34 points with DB having a far superior goal advantage, however, with Scottish having played a game less the ball is firmly in their court as to where they finish in the league. At the other end it was a crucial game for Corinthians as they faced Mes who sat 3 points above them. A win for Mes would pretty much see them safe while a win for Corinthians would pull Mes firmly into the relegation battle – as it turned out a 1-1 draw probably helped Mes more. Cors took the lead just before half time (no scorer confirmed) with MEs equalising via Oumer Keita. All eyes are now focused on the upcoming game between Cors and Krauts which is the proverbial six pointer!!! San P’s could only muster 8 players by 11am on Saturday and as such had to forfeit to Forward who were awarded a 3-0 victory and moves Forward to within one victory to claim the title. In Division 2, it is now a two-horse-race for the title between Bants and Soho Spartans. Bants made no mistake during the weekend when they thrashed once leaders Vikings 6-1 to sustain the 2-point-lead. Jan Nguyen, Gavin Chung, Phil Au, Willie Lee each delivered a goal and together with a brace from Lee Hodgeson it wrapped up this crucial victory in their run for the title. Consolation goal of Vikings was scored by the current top scorer of 2nd Division Lars Nielsen, who is now in a tight race with Lee Youngsen from Soho. Soho Spartans also kept up their nerves to nail down a hard-fought 2-0 victory over once title challengers Revolution. No goal from Lee Youngsen but his teammates John Keane and Koen Klein Tank took over the scoring task. “It was a hard-fought game till the end and Sohos scored the 2nd in the last minute of the game,” said Dan, manager of Sohos. Coming Saturday it will be the head-to-head encounter between these two clubs and no doubt it will be the most important game for them in the season. Team Shotguns outclassed KCC Royals at their home soil with a 4-0 victory. Hin Mok, Derek Huang, Ambrose Wong and Sean Ko all put their names on the scoresheet. On the same Monday night another KCC team Cavaliers had a bit of better luck when they ended up all square with Samurai Blue. Samurai dominated the first half with a 1-0 lead, missed penalty and couple of threatening shots denied by the keeper. After the break Cavaliers showed more determination and equalized after 10 minutes. Samurai took the lead again but Cavaliers levelled the score with an own goal by Samurai, conceded 10 minutes from the end. KCC keeper was hailed as the savior for his team by Samurai’s manager Kais. Scorers for Samurai were Ho San Chow and Connor Killeen. In 3rd Division, the title race was not as exciting as that of Division 2, with leaders Young Guns basically having everything under control. After routing Legal 8-2, they now have a 3-point-lead over Shui Wei, with a game in hand. Nick Lo was the hat-trick hero for Young Guns while Dave Tse, Dennis Chan and Tsui Kit all delivered a goal each. Youngs Guns were quite clinical according to their manager Dennis while Legal Head restored some pride with a brace of goals from Darragh Keenan and one from Thapa Prakash. Elsewhere Shui Wei recorded a 3-2 victory over Old Speckled Men, relying on goals from John Xuan, Phil Carroll and Stephen Whatcott to put them to the second place. Scorer of the two goals from Old Speckled men was Oscar Pointon. TWF moved up to the 3rd place after recording the second consecutive win after ending a long losing streak. Score was level in the first half but after the interval Kazuhiro Takeda’s superb freekick beat the stand-in keeper of TWF, manager Jacob Ku. TWF refused to give up and their efforts got rewarded when Raymond Ng tapped in from a good pass by Fung Chan. Raymond got his second minutes later when he picked up a loose ball after a shot by Fung Chan was saved by the keeper. Fung finally got scored himself after delivering two assists in the dying minutes to seal the victory. Last but not least, at the opposite end of the table, BOC beat bottom team MBFC 2-0 to claim their second win of the season, with Tommy Taw and Tommy Kwan both on fire.